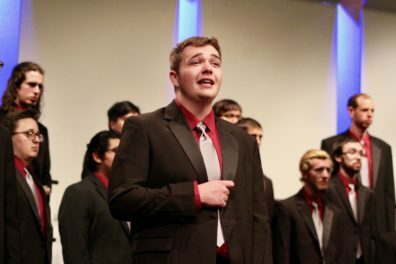 The WSU Tenor/Bass Choir is an ensemble comprised of students who sing either tenor or bass. Our membership comes from across campus and most singers are non-music majors. We meet twice a week (4:10 – 5:00 PM Tuesdays and Thursdays) and perform at least three times a semester. Our repertoire is varied. We sing canon’s of choral tenor/bass literature (Schubert’s Sanctus), but we also sing contemporary choral, pop/alternative, and musical theater literature (Bui Doi from Miss Saigon and Soul of a Man from Hell on Wheels). We hope to see you in a future semester of WSU’s Tenor/Bass Choir!